Former lightweight/featherweight champion Conor McGregor returns to the Octagon on Saturday night at UFC 229. He will face current lightweight titleholder Khabib Nurmagomedov at T-Mobile Arena in Las Vegas. It’s a tremendous matchup, one for the ages. And if UFC president Dana White’s prediction comes to fruition it will be the most-watched MMA pay-per-view event in history. Tickets for the event have already sold out and White claims this card is on pace to exceed more than 2 million buys. But there is much more than the lightweight title at stake for McGregor and Nurmagomedov. Heading into this bout, Nurmagomedov [26-0] has not lost a match in UFC competition, more impressive, he has yet to come up short in a single round inside the Octagon. McGregor [21-3] will appear in the Octagon for the first time since Nov. 12, 2016, when he knocked out Eddie Alvarez in the second round at UFC 205 in New York’s Madison Square Garden. During that bout, McGregor was at the top of his game, landing vicious left-hand strikes that dropped Alvarez three times in the opening round before finishing him in the second. It’s that type of hard-hitting, action-packed performance that has made McGregor a major fan favorite and high-volume MMA pay-per-view attraction. It’s also the performance that further fueled his desire to face boxing megastar Floyd Mayweather Jr.
After McGregor did a lot of trash-talking, Mayweather made it known that he wanted to fight him in a boxing match. And the two met in a high-profile bout on Aug. 26, 2017. 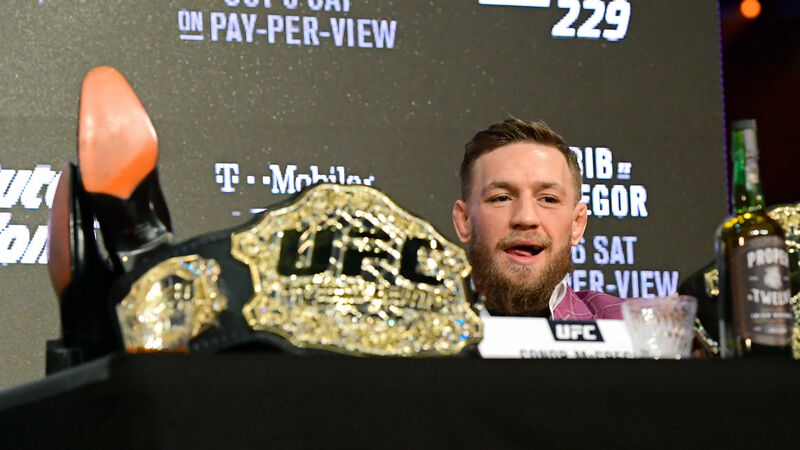 With his fan base larger than ever, the trash-talking McGregor returns to the Octagon, headlining what could turn out to be the most-financially lucrative UFC event ever. But the event also pits McGregor against arguably his toughest MMA opponent to date. While McGregor was testing his striking skills inside the boxing ring and enjoying time as a newly cemented multimillionaire, thanks to the showdown with Mayweather, Nurmagomedov has stayed active in the Octagon. He has improved his overall standing skills and remains a solid performer on the ground. Nurmagomedov will be making his first lightweight title defense and wants nothing more than to succeed against McGregor. But if he falls short, no one at UFC will shed a tear. McGregor promises Nurmagomedov will not only fall short but his wrestling skills won’t be a factor. Nothing would be sweeter for UFC than a McGregor victory Saturday night. There is no fighter on the promotion’s roster with more clout and value at this time than McGregor. He puts more fans in seats whether at arenas or in homes watching on television. McGregor has participated in the main event on the top four UFC pay-per-view events. His rematch with Nate Diaz at UFC 202 is currently No. 1 with 1.65 million pay-per-view buys. His boxing showdown with Mayweather drew 4.3 million pay-per-view buys. A McGregor victory Saturday night will serve to further his popularity among MMA fans. And he has already begun politicking for another shot at Mayweather. It’s not likely to happen. But an impressive victory at UFC 229 will fuel interest — next time, maybe inside the Octagon. McGregor’s popularity is already paying off as he recently signed a six-fight deal with UFC. This fight with Nurmagomedov being the first on the agreement. McGregor is so confident of victory Saturday night that he’s begun looking to future bouts. Nurmagomedov has tossed McGregor’s boxing rival’s name into this fight by claiming he is the Mayweather of mixed martial arts. He’s had a very impressive career thus far, but he has a long way to go before seriously being considered the Mayweather of his sport. “I am the Floyd Mayweather in MMA. Right now, I am most active and dominant UFC champion,” Nurmagomedov said during a New York press conference. “This is my third fight in last nine months and 26-0, never lose a round. So how will this fight conclude? If McGregor can shed any potential cage rust after being away for nearly two years, he will win. A knockout isn’t out of the question. McGregor has too many potential mega-bouts in his future to come out on the short end Saturday night. He is very aware of this, which will increase his motivation and further fuel him to victory.